As I was touring Keepers of the Wild the other day, Linda my guide turned to me and asked, “Have you heard about our Memorial Day watermelon roll? As visions of people rolling giant watermelons towards the finish line at a Memorial Day picnic danced through my head, I stammered, “Um, no, not really.” And that’s when she filled me in on the finer details of “Watermelon Roll Keepers of the Wild Style”. First and foremost Keepers of the Wild is a true wildlife sanctuary in every sense of the word — they don’t breed their animals, they don’t sell or trade their animals, and they discourage employees and volunteers from having close contact with the animals. Even though the animals are in enclosures — and during cleaning time in large cages — they still encourage natural behavior. That’s where the watermelon roll comes in. One of the natural behaviors they want to encourage is “getting rid of things that don’t belong in the animal’s space.” In the wild if an animal or a human invades their space, most animals will chase them away, and that’s a normal response. So the folks at Keepers of the Wild periodically put something in each animal’s space that does not belong — and on this Memorial Day it will be watermelons. As Linda explained it to me, the animals — especially the big cats — certainly don’t recognize the watermelon as food, but they do want it out of their space, so they basically destroy it. Oh and there’s nothing special about watermelons, as they’ve done this exercise with pumpkins and even empty boxes. Anything that doesn’t belong and won’t harm the animals is pretty much fair game. So if you happen to be in the Kingman area on Memorial Day Weekend (May 25-28), come out and see the watermelon roll at Keepers of the Wild! 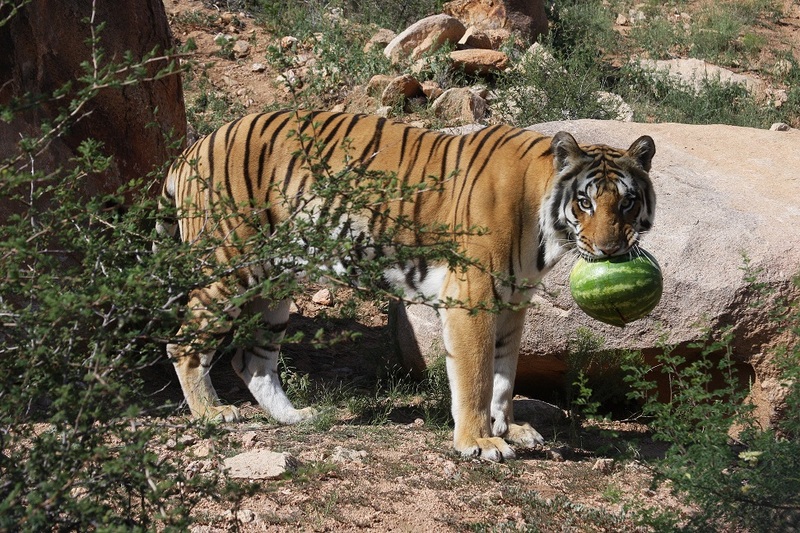 Watermelons will be given to the animals on the 10 AM and 1 PM safari tours. And if you bring in a watermelon over the weekend you’ll also get a 15% discount on admission. And I have to say that I was really impressed with the access at Keepers of the Wild. The sanctuary itself has a few level trails, and the safari tram tour is ramped and wheelchair-accessible. The staff is well versed in access needs, and very accommodating. So plan a visit this weekend, or on your next Arizona visit. For more information about Keepers of the Wild, visit www.KeepersoftheWild.com. This entry was posted in Attractions and tagged Arizona, attraction, Keepers of the Wild, Kingman, park, route 66, tour, Valentine, wildlife by Candy B. Harrington. Bookmark the permalink.